Cooking steak on a slab of pink Himalayan salt isn’t like cooking on steel. When you cook on a Himalayan salt block, the heat of the block sears and browns proteins of the steak and melts fat, while the salt subtly dehydrates the surface and seasons to perfection. Together the heat and salt work in harmony to produce a tremendously tender and salted steak slices. We use steak as an example because its one of our favorite things to cook on Himalayan salt. But these principles can be applied to cooking on salt in general – from scallops to eggs, bell peppers to fiddleheads and duck breast. For more information, see: Our Guide to Pink Himalayan Salt Blocks and Meadow fan Deanna Dawson’s How to Cook a Hanger Steak on a Himalayan Salt Block guide. This recipe is adapted from the “Salt Block Gravlax” recipe in Salted: A Manifesto on the World’s Most Essential Mineral, with Recipes. Cover one block with half of the dill sprigs. Mix the dry ingredients. Place the salmon on the dill-covered salt block, skin down. 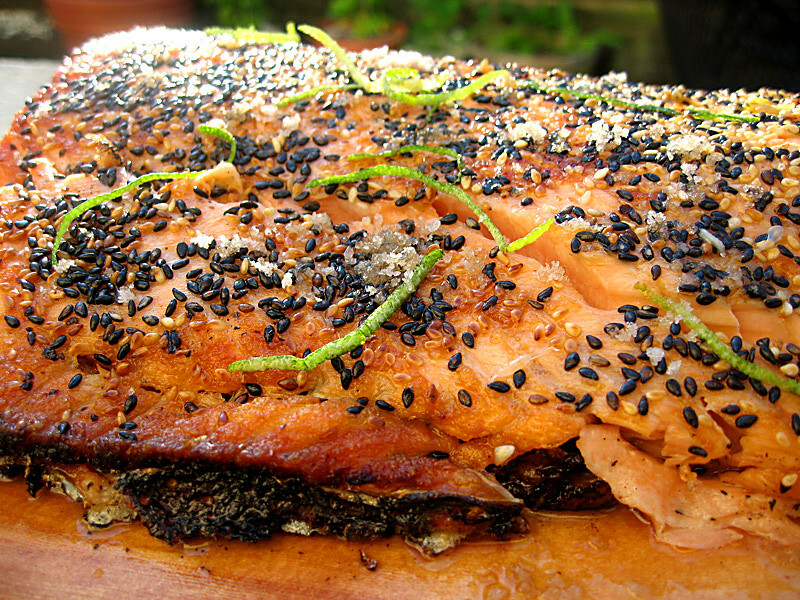 Coat the fleshy parts of the salmon, and cover with the remainder of the dill sprigs. Place the second salt block on top, wrap the whole thing in plastic wrap, and place in a fridge. Leave in the fridge until the fish becomes resilient but not firm to the touch. The top surface should be dry, the sides moist, and the flesh will be slightly opaque. Allow one to three days. Thinner and wild salmon cure faster, while thicker and farm-raised salmon take longer. When it is ready, unwrap the gravlax, rinse off the spices, and pat dry. Serve skin side down on melba toast or crackers. The vegetables of summer are steadily dropping off their vines and sliding back into the sun-soaked recesses of memory. Much as I look forward to fall–rain, endive, leaves, rain, a hiatus from mowing the lawn, endive, rain–I still crave the crisp, succulent, almost arrogant freshness of a veggie sandwich: all that is vegetal between the savory bookends of bread and cheese. And nothing loves a great salt like a veggie sandwich. My favorite: Amabito no Moshio (藻塩) is an ancient type of Japanese salt, called shio. Shios are identifiable by their fine, snow-like texture. Their firm, intensely mineral backbone lends a delicacy and brightness to food, much as acidity supports definition and complexity in wine. Amabito no Moshio is the granddaddy of shios, created some 2,500 years ago in what was then more or less a neolithic Japan. Seaweed was hauled out of the water by fishermen and dried on the rocks, then sprayed with water, then dried some more, then sprayed some more, etc. etc. until a now salt-encrusted seaweed could be rinsed to make a saturated brine. The brine, along with bits of the kelp, would then be boiled off over a wood fire, resulting in a delicately seaweed-infused salt. Today, The Meadow’s Amabito no Moshio, made with the hondawara variety of seaweed (Sargassum fulvellum) is inspired by that tradition. If today is your day to celebrate the veggie sandwich–perhaps your last true fresh veggie sandwich of the year–do it with the proper reverence, and with a last backwards glimpse of summer’s sunny sanctity. A salmon caught high in the freshwater streams of the mountains bears within its pink flesh the flavors of faraway places in the Pacific Ocean, a rosy imprint of the long voyage back to its birthplace. These fish see a lot of things below the ocean depths. And then they eat them. Salmon deserve a suitably thoughtful and voracious treatment in the kitchen. Iburi-Jio Cherry, a smoked sea salt from Japan, has endured a journey comparable to that of the salmon. Artisanal salt makers plumb seawater off the coast of the Oga Peninsula, drawing a pristine brine up from the pure, deepwater currents. After concentrating the brine, they heat it over a wood fire over three days, stirring constantly to produce a salt that is the texture of powder snow. This salt is then gently cold smoked over cherry wood for a sweet, smoky, bacony aroma that is unrivaled in the culinary world. The combination of deep sea minerals, cherry wood smoke, and buttery salmon takes your taste buds on peregrinations through flavor’s most unfathomed depths.